The toughest part of running a growing business is dealing with the growing pains. Your company may be running out of operation room, but building a new facility is a huge investment, and your growth might not stay 100% constant. This uncertainty can affect your facility planning, and a cramped workspace can affect your productivity. If you are running a little tight on space but you don’t have the money or space for a new building, you can practically double the usable workspace in your facility using a modular mezzanine system from Panel Built. The structural steel mezzanines are the most efficient way to provide your facility with more usable space without wasting any extra time or money. Your mezzanine will utilize the verticle space above your warehouse floor so that you have additional storage or work space without taking away from what you are already using. Panel Built manufactures the best structural steel mezzanines due to their attention to detail, quality of materials, and expert craftsmanship. Here are a few very useful questions that you will need answers to in order to know as much as possible about our steel mezzanine systems. Yes. In fact, every modular project that we manufacture here at Panel Built is custom made with your customer in mind. They can be designed, engineered, and manufactured to your exact specifications. 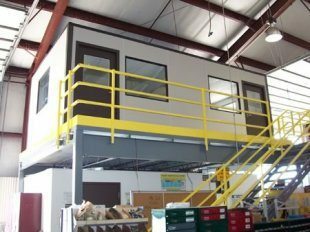 Not only are we a company that sells prefabricated steel mezzanines, we offer a variety of modular units to help create the perfect space for your business. When you customize your mezzanine, you can choose columns and base plates, material as well as size and color. 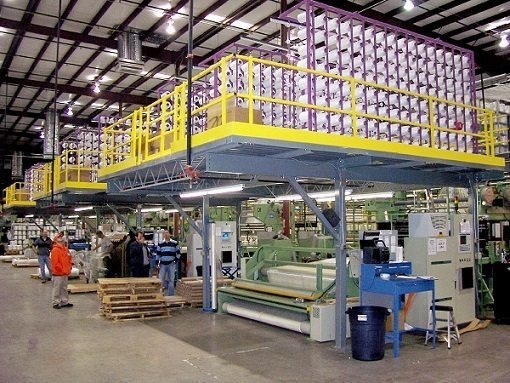 Our mezzanine systems are designed with each of our customers’ specific needs in mind. No matter which choice you make, big or small, your new mezzanine system will arrive ready to install quickly and with as little site disturbance as possible. The term cold-rolled mezzanine refers to the understructure systems flooring. Sheet metal is attached to created support beams for your mezzanine flooring. There are some benefits for these types of structures; specifically, they are lightweight, which makes them cheaper to ship and easier to move. Additionally, the construction and installation of the mezzanine is usually easier because they weigh less and thus easier to move around. The biggest drawback of this type of mezzanine is that they cannot handle as much weight as your standard structural steel mezzanine. If you need something simple that is designed to hold lighter loads, the cold-rolled option may be the perfect solution for you. What type of Mezzanines do you Sell? Panel Built’s mezzanine office systems provide a great workspace to your facility, without taking up any extra room on your facility floor. These units are designed to sit on top of or below a mezzanine and can be accessed by stairs, ladders, or even ships ladders. As with all of our projects, these modular mezzanine offices are built custom for you; so they can be made as big or as small as you need it. 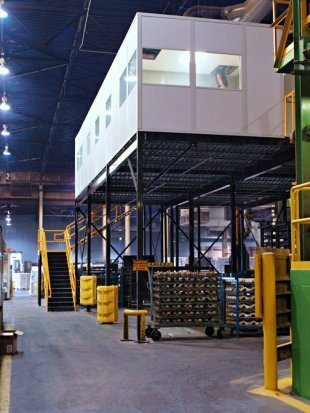 Our mezzanine systems can be designed to hold as much weight per square foot as necessary for your application. Office mezzanines are a great option for spaces that don’t already have separate office space. Steel mezzanines weigh more than a cold rolled mezzanine system, but they are capable of holding much more weight per square foot. In fact, if you are looking into a mezzanine office system, a structural mezzanine will more than likely be the type used for your project. An additional benefit of these structural mezzanines is that they are perfect for industrial spaces. Not only will they blend in with the rest of the building, they are easy to maintain and easy to clean when necessary due to their layer of powder coating instead of paint. These types of mezzanines are usually designed to create safe walkways (like catwalks) or storage. Where a more structural mezzanine could additional floor space, these are usually designed more for convenience, they are also easier to move because they are freestanding (as their name implies) and aren’t attached or built form another part of your building. 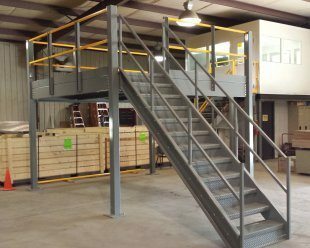 Steel mezzanines are generally much more affordable for small businesses than building additional storage space, building a new warehouse, or even moving into a bigger facility. There are several reasons ordering an affordable Panel Built mezzanines online is often a better option, especially for smaller, growing businesses. Secondly, you are already utilizing space that you have. While you are increasing the amount of usable square footage in your industrial building; you won’t have to worry about adding to the exterior of your building or moving buildings all together. In some cases, you may be able to install a mezzanine without a permit. However, structural mezzanines will require a permit since they are installed as part of the actual structure and increase the square footage. Additionally, you don’t have to pay for additional labor. You can do the installation yourself using our installation manual. This means that you save plenty of money on your project like you would pay someone else to remodel your current space or add additional square footage. You can do the installation yourself or have employees assist. Lastly, you save money when you purchase the best modular mezzanines available for sale via uninterrupted and continuous man hours. A remodel could cause significant disruption in your facility due to the dangerous construction process and the excess materials that would be needed to stick-build the mezzanine. We manufacture your mezzanine system off-site and deliver it directly to your facility. There you can install the new system in very little time which eliminates to significantly reduces any workplace disruption that could potentially take place. We know how stressful it can be to transition from a smaller business to a bigger area in order to take care of all of your work processes. Of course, there will be growing pains, just like with all businesses. However, we can help ease those pains by helping you create additional space for less money, less time, and far less hassle. To learn more, contact our customer service agents, or request a quote directly online!